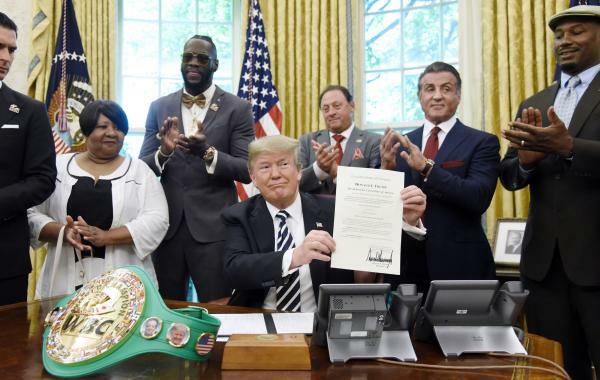 President Trump pardons Jack Johnson, the first black heavyweight champion, who was convicted in 1913 of transporting a white woman across state lines. “Today I’ve issued an executive grant of clemency, a full pardon, posthumously, to John Arthur ‘Jack’ Johnson … The first African-American heavyweight champion of the world, a truly great fighter. Had a tough life,” Trump said. Johnson was convicted in 1913 of traveling with his white girlfriend across state lines, which was prohibited under the Mann Act — also known as the White-Slave Traffic Act. The law, which hadn’t yet gone into affect at the time of his conviction, was designed to prevent prostitution and “immorality” but was often exploited to intimidate interracial couples. Johnson skipped bail and fled the United States after his conviction and later returned to serve a one-year sentence. He died in 1946. 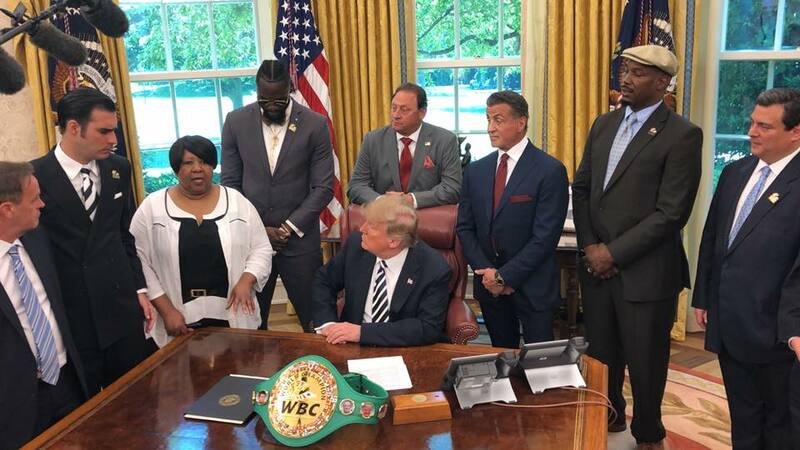 Trump welcomed Johnson’s family, current heavyweight champion Deontay Wilder and actor Sylvester Stallone to the event at the White House on Thursday. 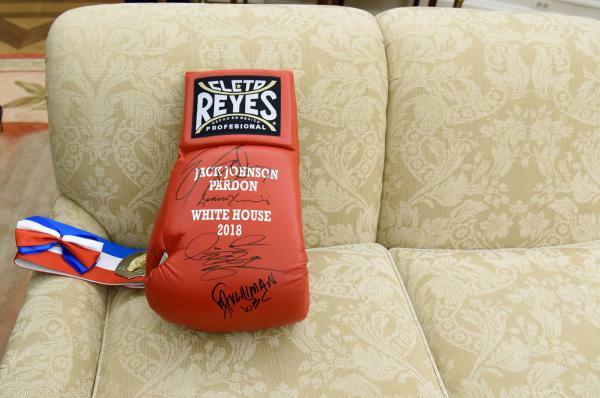 Stallone, who played the title character in the 1976 Oscar-winning boxing film Rocky, reached out to the president earlier this year to plead Johnson’s case. This entry was posted in Government, News. Bookmark the permalink. Nothing like pardoning someone after a hundred years, its so meaningful. Most Americans don’t even know what this man was convicted of. I’m sure it matters to his family. Our President is a good and caring man. No other President has bothered to right any of the wrong done against Jack Johnson. Thank you, President Trump. As a kid I collected all kinds of historical data from print media, and had some photos of Johnson. Of course I didn’t know anything then about the Mann Act or Johnson’s girlfriends. I collected photos of him simply because he was a boxing champion, just like I did for Jack Dempsey and Joe Louis or Ingemar Johansson. Not until James Earl Jones starred on Broadway in “The Great White Hope” did I find out the background on Johnson’s life. That was in the late 60s. And later he starred in the film.